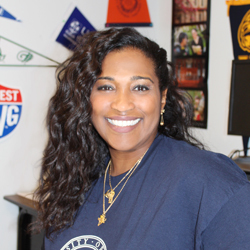 One of the main reasons that high school counselor Cherise Ogle chose a career in counseling came down to an observation: “it was amazing to me just how clueless a lot of young adults these days were in regards to the college process,” she explains. After she left Oglethorpe University, Ogle decided to pursue her new passion and became and independent counselor. While she found her new career path rewarding, she felt that she could still do more for the students in her community. “In the state of Georgia, college advisors don’t exist outside the private schools,” she explains. Ogle knows how important it is to get her students excited about planning for college, so she makes her events both fun and informative. One of the events that she plans for her students each year is an open house in her school’s college and career center. Ogle will start by sending out invitations to different teachers in the school and have them bring their classrooms to her event where they will run different college-planning sessions for the students to explore. “We might play the GPA game, we may do a mock admissions trial or something along those lines,” she explains. The GPA game, which Ogle puts together with help from the NACAC and SACAC websites, acts as a means of showing students what it takes to be an ideal candidate to a college. “The purpose of the game is to say that GPA is important, but a well-rounded student is the key,” clarifies Ogle. Ogle says that with these events, students start thinking about college planning on their own. “[After coming to the open house], they actually start to think about the college process,” says Ogle. They start to ask questions like “what exactly is it going to take to get to college?” and “what can we do to get started?” Ogle says that their ultimate goal is to make sure that everyone who leaves at the end of her open house has a great understanding of his or her goals as well as how to get there. In addition to her open houses, Ogle also sets up an Apply to College Night for her students. Beyond having students sit in front of a computer and apply to college after college, Ogle also sets up different stations where students can do mock interviews and practice what they would say on their college essays. Some examples of the generosity that Ogle and her students have received from members of her community include scholarships and essential school supplies. “They have offered our students about $2,500 in scholarship money out of their own pockets,” explains Ogle. “They have [also] donated materials like USB sticks for students to write their essays and save it that same night.” They also lend their skills — “I can send them an essay to read and four days later they’ll send it back.” Ogle is amazed at the relationships these professionals form with her students, not just on her college night, but also throughout the rest of the year. As with every environment, Ogle’s job as a college counselor is not without it’s challenges. For her, Ogle finds her biggest challenge often comes in the form of trying to reach all of her students to the best of her ability. “Meeting the needs of every student and making sure that we’re able to help them in some manner [is a challenge],” she admits. However, Ogle takes the stance that rather than being something to make her job more difficult, the challenges she faces helps her to think on her feet and come up with new ways of thinking. “Everybody comes in with his or her own nuances and what I love about it is every day is a new story, every day is a new challenge and every day is something new to think about,” she says. Laura Sestito is the Editorial and Production Coordinator for Next Step Education Group. What is the first year college seminar?